During Busworld Turkey, and immediately after the launch of all three new Setra models on the Turkish market, I interviewed Rainer Genes, President and CEO of Mercedes-Benz Türk. He is responsible not just for buses and coaches but for all the company’s operations in Turkey, including cars, vans, minibuses and trucks. Last year, in Turkey, Mercedes-Benz hit a record of 50,000 sales. 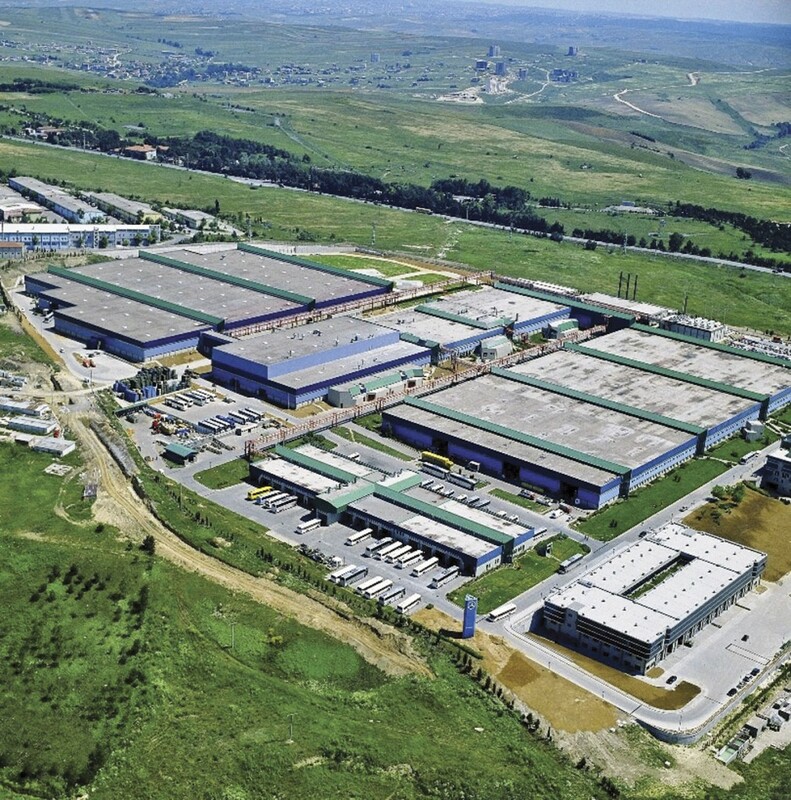 The modern truck factory in Aksaray, in central Turkey, built 18,500 units last year mainly for the domestic market. Rainer Genes has an interesting and comprehensive automotive background. He previously worked in the car industry, mainly on production, before joining Mercedes-Benz in 1997. He continued working on the car side, including major projects like taking a new model from the design and prototype stage to full manufacturing. Just over a year ago, he took up his present appointment and said that he was enjoying it very much. We talked about the product range being built in the Hosdere factory. The Conecto low floor city bus is available in solo and articulated versions and with various engines ratings from Euro3 to Euro6, depending on market regulations. There is the Tourismo, including right hand drive models for the United Kingdom, and the Travego range. That includes the standard RHD model that is mainly supplied to Western Europe. The higher SHD model is only for the Turkish market, because there is demand for greater luggage capacity. Rainer Genes said that the factory built 4,005 vehicles last year, an all-time record, and at full capacity. 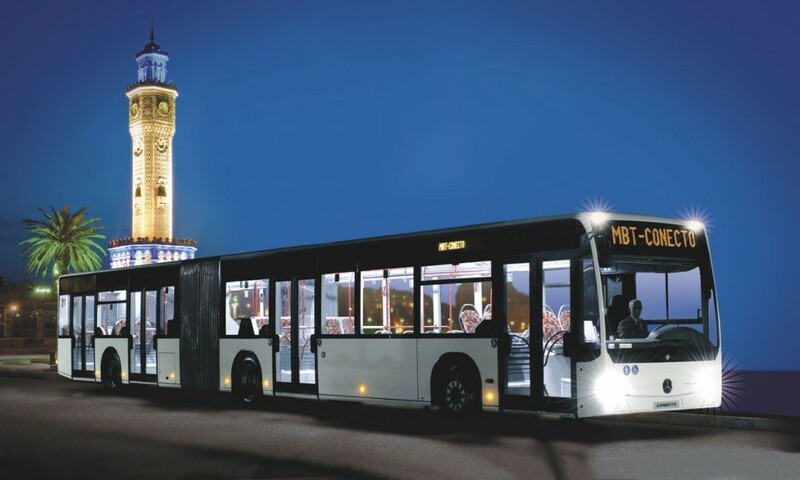 Sales in Turkey totalled 1,174 units of which 941 were coaches and 233 were city buses. 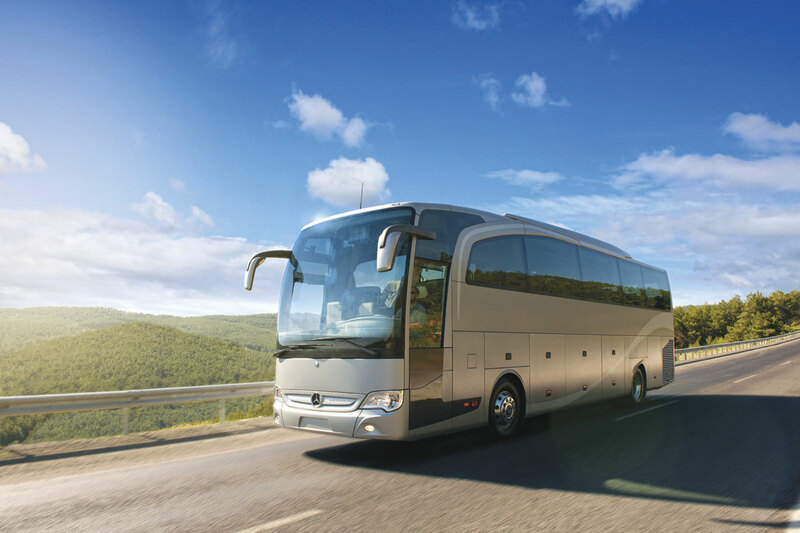 The company consistently takes 65% of the long distance and tourist coach sales in Turkey. Hosdere increased its exports by 28% compared to the previous year with 2,861 units, especially to Western Europe. Germany and France were particularly strong markets for the factory. During various other discussions in at Busworld Turkey, there were suggestions that some of the large tenders in Istanbul last year had been won at highly competitive prices. That is why Mercedes-Benz city bus registrations appear to be relatively low. We talked about trends in the city bus market. There is on-going demand for diesel and CNG vehicles. Rainer Genes thought that there would be little if any demand for hybrid vehicles, but there could be some interest in all-electric vehicles. The Turkish Government is supporting a major project in this field. Capacity at Hosdere is being increased from 4,000 units per annum to around 4,700 per annum. Part of the reason for this is that Daimler Buses has a long-term contract in Algeria. The Conecto bus will initially be supplied to the Daimler factory near Algiers almost fully built up from Turkey. The Algerian content will be increased progressively when suppliers are found and employees are trained. This is an additional major market for the Turkish plant. Rainer Genes said that the increase in capacity had required extensions to the paint shop. The factory was working two shifts for six days a week with a total headcount of 2,500 of which 250 were white collar. In addition to that, 325 engineers were working on a number of Daimler Buses projects and truck development projects. It means that 2,500 people built nearly two vehicles per head last year. If you think of the old yardstick of one vehicle per man per annum, this is highly efficient, especially at competitive Turkish labour rates. Much of the test driving of engineering prototypes and new vehicles is carried out for Daimler Buses in Turkey. Traffic conditions in Istanbul are a challenge for any bus, with lots of congestion, but also some severe gradients. Out in the country, there are some very testing roads and also a wide range of climatic conditions. The company offers many regular training courses for all levels of employees, including technicians and graduates. The average age of the workforce is relatively young, particularly by Western European standards, and workers in the factory are multi-skilled. The Turkish education system produces well-qualified technicians and graduates and many want to work with international companies like Mercedes-Benz. The factory also has a strong social side with leisure and gymnasium facilities, and teams that participate in several sports. When I first visited Hosdere, it was in the countryside quite a bit beyond the boundaries of Istanbul. Its only neighbours were an army camp and satellite factories occupied by some of its main suppliers. Istanbul has now reached Hosdere. The EvoBus factories in Hosdere, Mannheim, Neu Ulm and Ligny-en-Barrois (France) all work to exactly the same manufacturing and quality standards. It means that there is total flexibility in production. If there are surges in demand for one product, mainly because of success in international tenders, then the factories can help each other. Hosdere was already building Travego coaches for Turkish customers and other important markets in the region. It has since taken over production for European markets quite seamlessly from Germany. I suspect that the costs of transporting mechanical units from Germany is more than offset by the lower labour costs in Turkey. The most recent decision has been to build Business versions of the Setra MultiClass in Turkey so that the range can be more competitive in important Western European markets. Mercedes-Benz Türk has also taken over the rights to sell the Setra range from the previous importer. Setra has established a strong reputation at the top end of the competitive inter-city coach market. Setra can offer highly sophisticated specifications including large and very comfortable seating with single rows on one side of the gangway and twin seats on the other. On the busiest routes, there are customers who are prepared to pay for the higher quality of these vehicles, compared with standard 2+2 seating. Indeed, Turkey was one of the first markets where Setra offered connectable wi-fi on such coaches. Mercedes-Benz Türk is also very successful in the market for Sprinter minibuses and minicoaches. There are quite a number of converters in the country, selling not only in Turkey but in export markets. Some of those vehicles are relatively standard, for instance school buses, but others have extremely luxurious interiors for as few as four or six passengers. Turkey will move to Euro6 emission standards from 1 January 2016. While that will be a challenge for many of the local competitors of Mercedes-Benz Türk, the company has already done the hard work, because of its supplies into Western Europe. I have long thought of the Hosdere factory as a benchmark in bus and coach manufacturing and that has not changed after my interview with a modest but confident Rainer Genes. The Turkish company never sits back and relaxes, but is constantly looking for ways to improve its products and processes. That should be re-assuring to its customers, including those buying the Tourismo in our market.